Though the flames that overwhelmed Kalimantan for months are now out, it seems the damage may have already been done. Since September, the Orangutan Foundation rescue team has rescued an orangutan from burnt and desolate forest on a weekly basis. Now, the fires may have come to an end but this rise in rescue activity has not. Orangutans are elusive creatures, and provided they live in optimum habitat, are relatively difficult to spot (much to the grievance of orangutan researchers!). Yet this morning our teams rescued a young juvenile orangutan who could be seen at a distance, clambering the topmost point of an isolated tree just 500m from a main road. The proximity of this rescue to a public road is evidence of the devastation that wild orangutans will continue to face thanks to three months’ worth of wildfire. As you can see in the images below, the habitat where this young orangutan was found has been very badly affected by the fires. Thankfully, the orangutan himself appeared to be in good health and will be released into the Lamandau Wildlife Reserve right away! These fires have resulted in a surge of orangutan rescues. To follow all of our orangutan rescue and release activity, please visit us on YouTube and Facebook. Orangutan habitat continues to be under threat. You can make a difference by donating towards the Orangutan Foundation's fire-fighting team, or by sharing this video with your friends and family to help us raise awareness for these difficult times. October 2015 Last Monday the Foundation rescue teams received a report from landowners in Mendawai that several orangutans might be trapped in an area nearby. This area in question was a narrow strip of forest, completely surrounded by fire and smoke. Our teams, alongside members of the BKSDA, swiftly headed to the scene and, though the haze was thick, they were able to make out a large male orangutan in the clearing. In spite of the vet darting him with an anaesthetic, the male was merely slowed down because of his size, and was still able to scale a tall tree. 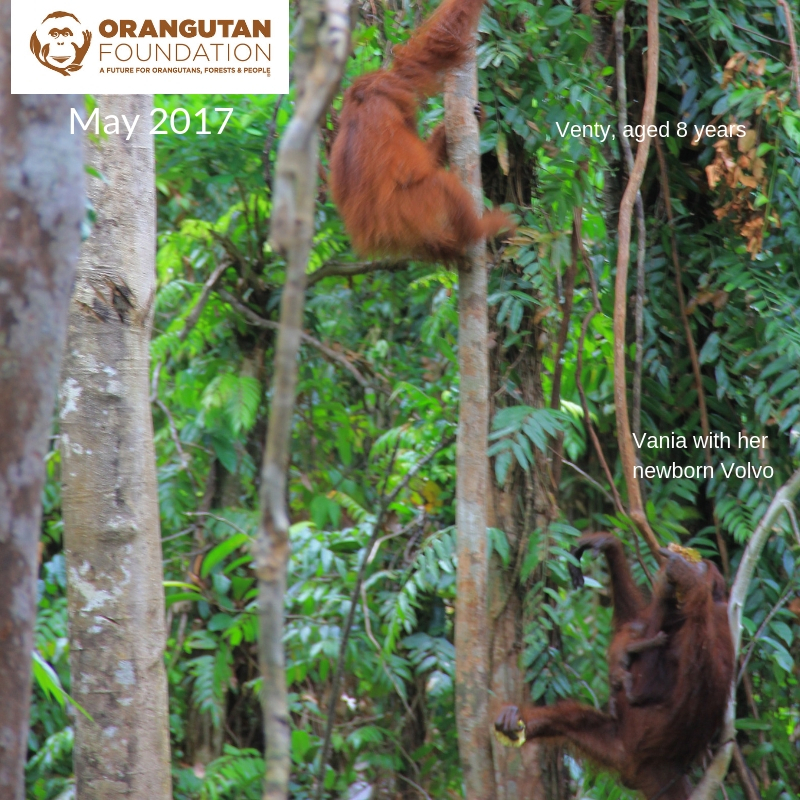 The height of the tree was too dangerous for our team members to climb, and before long the orangutan was once again on the move. Hours of following ensued, but eventually the thick haze from the fires overwhelmed the area and the atmosphere became too dark to continue. Though the rescue attempt failed, our rescue teams endeavoured to try to again the following day. But on the following day, further reports were made to the Orangutan Foundation that, according to our staff, orangutans were “falling to the ground” because the forest was almost completely burned down. Trees were dried to a crisp and the air engulfed by heavy smoke. Despite these terrible conditions this rescue attempt was more successful, and our teams were able to rescue an adult female and her infant. The pair have now been named Vania and Venty, aged approximately 26 years old and 5 years old respectively. Though this mother and her infant will be released into the safety of our protected Reserve, this turn of events only demonstrates the immense devastation facing Kalimantan’s forest habitat. Because of the extreme haze cloaking the entire region, it is likely that many more orangutans are stranded in these fire-damaged areas of land. Unless reported to us, there is no way of knowing where these orangutans are that are so desperately in need of rescuing. The conditions caused by Indonesia’s fires have posed serious problems for the local people, as well as for their eco-tourism. Now we know that the dramatic weather conditions are affecting the wildlife within the forests as well, with more and more of their habitat continuing to be lost every day. Note: Since writing this post, another orangutan has been rescued by our teams. That’s one failed rescue and two successful rescues in three days. More details to follow. July has been met with an alarming number of fires in Central Kalimantan. Break outs have occurred worryingly close to our guard posts at Vigilant Howe, Danau Burung and Sungai Pasir. As you can see from the map below, these posts mark the outskirts of the Lamandau Wildlife Reserve, which means that these fires have encroached upon protected land. The damage found indicates that these fires were set intentionally by hunters hoping to attract deer to fresh grasslands. Foundation staff, alongside the BKSDA, has succeeded in putting out the bulk of the outbreak, but for now fire surges on in Sungai Pasir. Limited equipment and staff numbers in the area mean that our teams have to work that much harder to fight the spread of fire caused by high winds. We are confident in our ability to manage outbreaks such as these; however the proximity of these fires to our orangutan release camps requires constant monitoring. Please DONATE and quote 'FIRE' to help us fund new fire-fighting equipment! As we enter the dry season in Kalimantan, Indonesia, we're taking every precaution. Our field staff are going the extra mile to raise awareness and stop the breakout of fires in areas surrounding protected forest. Every year fire is a constant worry. Naturally occurring fires are prevalent throughout Indonesia, and the tradition of ‘slash and burn’ farming can also be used as a method to prepare for oil-palm plantations. In open stretches of land where the air doesn't hold as much moisture, these fires are a constant challenge to control. A fire that cannot be easily extinguished can wipe out forests that are home to thousands of species, including the endangered orangutan. That is why the Foundation has always made fire prevention a priority. In addition to fire training for all guard post staff, our employees in the field have called for local people to stop clearing the land with fire through the implementation of signposts. These steps are especially important because dry and barren landscapes, such as those pictured below, surround the areas of forest in which we work. These patches of open land are especially susceptible to catching fire, and their vulnerability to wind only encourages fire to spread. In our efforts to raise awareness, we at the Foundation have built warning sign-posts all along the boundaries of particularly high-risk areas (highlighted in yellow). Through these actions, we hope to keep protected areas of forest, and all of their inhabitants, safe from harm. Please DONATE and quote ‘FIRE’ to help us fund new fire-fighting equipment! Foundation staff have welcomed the end to the prolonged dry season, more than three months. During this time, it was very difficult to reach Camps and Guard Posts with food and logistics. In spite of the low rivers and logs blocking access, staff were still able to get supplies to the camps and guard posts, even if it sometimes took them 6 - 7 hours, rather than the normal 2 - 3. Even under these difficult conditions, the staff carried out their work with dedication and good humor. The dry season is also the reason behind the fires that occur annually - this year they were especially severe. For the future, the Foundation staff need to be prepared by creating more bore holes and providing extra fire fighting equipment. It is only through these measures that we are able to control the fires and to prevent any further destruction to the forest and threats to the wildlife. Thank you to all our dedicated staff in the field.